Although we are fewer than three months away from the 2019 Kentucky Derby, the quality of Derby prep races this weekend is well below the standard we have become accustomed to seeing. 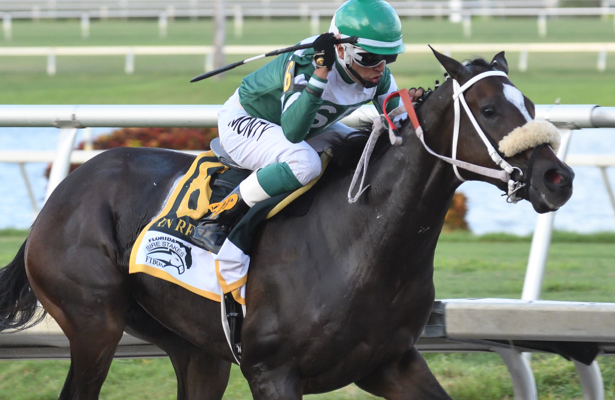 There are two stakes races to watch and review on Saturday: the Grade 3, $250,000 Sam F. Davis Stakes going 1 1/16 miles at Tampa Bay Downs and the $150,000 Jimmy Winkfield for New York-breds at Aqueduct. All the other stakes on Saturday Feb. 9 are for older horses, fillies, turf runners and state-bred horses of various ages. As I see it, even the two stakes scheduled for Derby-age colts and geldings are unlikely to point out legit contenders for the Derby. Even still, there are four in particular I'll be watching. Taking a look first at the Jimmy Winkfield at Aqueduct, six of the seven entered have already won one or two races, only three in the field have won twice, and no horse in the field has won at one mile or longer. The horse in this race who has earned the highest Beyer Speed Figure is Haikal, who registered a respectable 85 rating after overcoming some bumping to win a six-furlong maiden race in his second career start. Trained by Kiaran McLaughlin, Haikal will be making his first start of 2019 after a series of positive workouts. Recently, McLaughlin predicted that Haikal is “fit and ready to run well in this spot” and privately, he also predicted that Haikal could be a legit factor in longer races as we move deeper into 2019. Note, he is a sibling to the Grade 1 winner Takaful. In the other Saturday race that offers some potential for 3-year-olds with Derby dreams, the two horses who caught my eye in the Sam F. Davis were Well Defined and Kentucky Wildcat. Kentucky Wildcat improved when stretched out to a one-turn on Dec. 1 at Aqueduct and has trained superbly for his 2019 return for trainer Thomas Albertrani. In recent weeks, Kentucky Wildcat has racked up a solid series of morning workouts as if he is ready to run back to the 86 Beyer Speed Figure he earned in his final start in 2018. Meanwhile, Well Defined has been prepping for his Aqueduct debut after some good tries at Gulfstream for high-percentage trainer Kathleen O’Connell. For his race on Saturday, Well Defined will add blinkers for the occasion. At age 2, Well Defined earned a terrific 91 Beyer Speed Figure winning a 1-1/16-mile stakes for Florida-breds at Gulfstream. More recently, Well Defined has looked good in his morning workouts and as such, he deserves some attention. So does Five Star General, a two-time winner to close out his 2-year-old campaign last fall at Laurel in Maryland and Aqueduct in New York. Obviously, all the horses in this stakes have room to improve at this point in their careers. We should be able to glean quite a bit from the Sam F. Davis. One might even prove me wrong and look like a real Derby threat. I'll circle back on those races early next week with follow-up thoughts. Steve Davidowitz has written many books on handicapping, including the classic, "Betting Thoroughbreds." His Across the Board columns appear regularly at Horse Racing Nation. Click here to read past editions.